This ruined village evokes its medieval past. 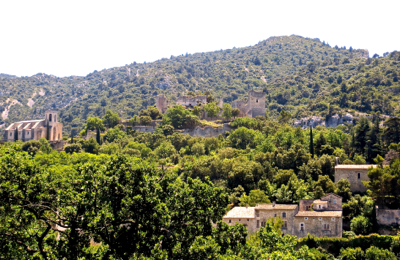 Oppède-le-Vieux hangs perilously on the side of cliffs in the Luberon, its fragile state witness to its long history. In medieval times, when its fortress and some of its houses were built, it was subject to many sieges and battles. In 1274 the vilage became the property of the Popes. When the Popes lived in Avignon(1309 - 1377), Oppède thrived, reaching a population of about 900 inhabitants in the 14th century. After the 16th century, with peace, most villagers moved off the cliff to the lower town, where they could more productively farm. This mass exodus left Oppède-le-Vieux abandonned, and it was undisturbed for centuries. During and since World War II, various artists and writers took up residency, bringing a little life back to the town. More recently, the inhabitants of Oppède (the "new" town that was formed) have created Oppède Patrimoine to restore and preserve Oppéde-le-Vieux. 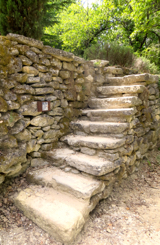 To visit Oppède-le-Vieux, you'll drive on a narrow winding road until you arrive at a small parking lot. Pay your parking fee and get a small map and start on your way. Getting up to the village requires walking on some lovely garden paths, up small staircases, and negotiating switchbacks in the path. Along the way there are a couple of viewpoints, such as the Threshing Area (Aire de Battage Sainte-Cécile), which provide lovely views of the village, its fortress and the surrounding countryside. This Aire, once used for threshing grain, is sometimes used for concerts, but mostly for views. You'll see how the village is built into the cliffs. Oppède-le-Vieux, seen from the Threshing Area. As you continue to the village, you'll pass through a variety of old stone houses, built outside of the walls. At the Village Square there are two restaurants, if you arrive at lunchtime or want a snack. From the Village Square, go through the archway and you'll be in the medieval village. Wind your way through the picturesque ruins, imagining the people who lived and worked there, until you arrive at the church Notre-Dame d'Alidon, with its hexagonal tower. The church was partially restored in the 16th century and is occasionally used for concerts. Just across from the church are the ruins of the château. While it may be possible to visit parts of the ruins, most is fenced off and in need of restoration. But from up top you will have lovely views of the Massif du Luberon, the valley, and even Mont Ventoux. 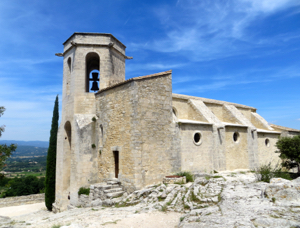 Unlike the other hilltop villages of the Luberon, Oppède-le-Vieux shows few signs of modern life. Yes, cars will pass through the Village Square, and the restaurants can be lively, but once you're within the walls it is like stepping back in time. With imagination, you can get a sense of village life in the middle ages. There are a few signs explaining the history of the village, but mostly it is a place for observation and contemplation. Oppède-le-Vieux is a great day trip from nearby towns such as L'Isle-sur-la-Sorgue (18 kilometers/11 miles) or Bonnieux (20 kilometers/12 miles) (map). 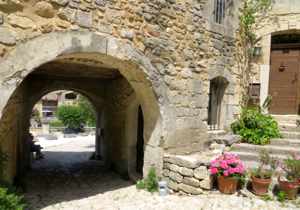 Above, The arched entrance to the walled village of Oppède-le-Vieux. Below, The Church of Notre-Dame d'Alidon.